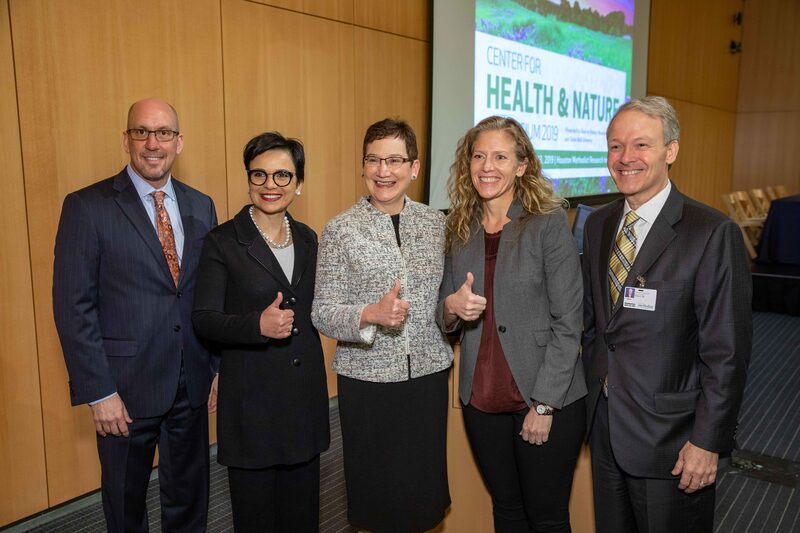 Leaders from the Center for Health & Nature’s founding organizations attended the Health & Nature Symposium held February 13th at the Houston Methodist Research Institute, including (left to right) Ed Jones, Houston Methodist Research Institute president and CEO, Bita Kash, PhD, director of the Center for Outcomes Research at the Houston Methodist Research Institute, Carrie Byington, MD, vice chancellor for health services at Texas A&M, Joni Carswell, CEO and president of Texan by Nature, and Marc Boom, Houston Methodist president and CEO. Bita Kash is the director of the Center of Outcomes Research at the Houston Methodist Research Institute. The Center for Outcomes Research is a joint center with Texas A&M University School of Public Health. Dr. Kash is professor of health policy and management at Texas A&M University. She is also co-director of a seven-university National Science Foundation (NSF) funded industry-university cooperative research center, the Center for Health Organization Transformation (CHOT), anchored at Texas A&M University. As co-director and PI of the NSF Center for Health Organization Transformation (CHOT), Dr. Kash conducts research to support the implementation of evidence-based transformational strategies within healthcare organizations. She also currently serves as the interim director for the Center for Health & Nature, a partnership between Houston Methodist, Texas A&M University, and Texan by Nature. She is a fellow of the American College of Healthcare Executives and an active member of Academy Health, the Gerontological Society of America, and Academy of Management. Her areas of research include organizational capacity for change and transformation, evaluation of organizational innovations and technologies in the healthcare delivery system, and healthcare strategic planning and marketing. Her most recent research projects focus on development of strategy bundles to reduce hospital readmission rates, and access to appropriate care. She has published over 80 articles in peer-reviewed journals. Dr. Kash’s research in the areas of perioperative care coordination and the effective use of health information exchanges has resulted in several publications in top-tier health services and policy journals, featured in the NSF’s “Industry-Nominated Technology Breakthroughs of NSF Industry/University Cooperative Research Centers (I/UCRC)” 2016 report, as well as Politico and other media. Finally, as editor-in-chief of the Journal of Healthcare Management (JHM), Dr. Kash lead a peer-reviewed journal in the field of healthcare management that incorporates a practitioner application for every research article published from 2014-2017. Total subscriptions for the JHM reach over 43,000 and include healthcare executives, practitioners, researchers, and students. Domenica Delgado is the program project manager for the Center for Health & Nature at Houston Methodist. A native Houstonian, and proud graduate of Rice University, she aims to leverage her experiences to lead the center in enhancing health and healing through nature. She organizes many of the activities of the program in relation to health and nature initiatives, including research, fundraising, and reporting. She also assists in the development and preservation of relationships in support of projects from design to implementation to evaluation. Domenica enjoys harnessing the mission of the Center for Health & Nature to drive research on the impact of nature on health care with evidence-based programs that complement the full continuum of health care: prevention, treatment, and recovery. Robert E. Jackson, completed his internal medicine residency at Baylor College of Medicine in Houston, Texas and has been in private practice at the Texas Medical Center for over 30 years. Dr. Jackson is a professor of medicine at the Weill Cornell Medical College. He is a clinical associate professor at Baylor College of Medicine and has received the Outstanding Clinical Faculty Award from Baylor twice during his teaching career. Dr. Jackson continues to be involved in education, research and patient care as well as quality integration for large physician groups and hospitals. Dr. Jackson currently serves as chair of the Continuing Medical Education Committee and the Center for Performing Arts Medicine at Houston Methodist Hospital. Dr. Jackson highly values education and mentoring young medical students and residents as they advance through their careers. With close collaboration with Cynthia Pickett-Stevenson, he helped spearhead the Center for Health & Nature initiatives. Rebecca Hall is the director of communications and academic reporting for Houston Methodist. Dr. Hall is responsible for executive and academic communications and marketing, faculty networking, and academic strategic plan and research development. Dr. Hall received her BS in biochemistry from the University of Illinois at Urbana-Champaign and her PhD in immunology from Baylor College of Medicine. She was assistant professor of cell and molecular biology at Baylor College of Medicine and is an Aspen Cancer Conference fellow. Hall received the Theodore T. Puck Award for Cancer Research for her work on molecular cancer diagnostics. She is a member of the National Organization of Research Development Professionals, the Society for Healthcare Strategy & Development, and the American Association for the Advancement of Science. Dr. Hall joined Houston Methodist in 2010 to lead its communications and external relations office for the Institute for Academic Medicine, overseeing communications, marketing, and academic development. Joni Carswell is the CEO and president of Texan by Nature where she is responsible for leading their mission to spur Texan-led conservation that produces tangible benefits for people, prosperity, and natural resources. Joni, who was previously CEO of LivingTree, pairs her business strategy, engineering and technology background with her passion for Texas and the outdoors to realize Texan by Nature’s vision of bringing both science-based and community-organized initiatives to the forefront. Joni is a member of Beta Gamma Sigma and served on the advisory board for the Kellogg Women’s Business Association. Cynthia Pickett-Stevenson is a fourth-generation Houstonian and a practicing attorney with over 36 years of experience. She is a longtime board member and former chair of the Galveston Bay Foundation. She serves as a director and co-vice chair of the Lone Star Coastal Alliance Board focused on securing a federal congressional designation known as the Loan Star Coastal National Recreation Area for the upper Texas coastal counties. Cynthia is also director of the Center for Excellence in Education, established by the late Admiral Rickover and Joann DiGennaro, co-chair of the Houston Methodist Hospital Foundation, is on the Houston Methodist DeBakey Heart & Vascular Center council, and is a senior cabinet member of the Houston Methodist President’s Leadership Council. Jay Maddock is professor of environmental and occupational health at Texas A&M University. He is internationally recognized for his research in social ecological approaches to increasing physical activity. Dr. Maddock serves as the senior academic advisor for the President George H.W. Bush China-US Relations Foundation and serves on the board of directors for the Texas Health Institute and the Well-Connected Communities Initiative. His research has been featured in several national media outlets including The Today Show, Eating Well, Prevention, and Good Housekeeping. Marcia Ory is a regents and distinguished professor in the Department of Health Promotion and Community Health Sciences and serves as director of the Program on Healthy Aging at the Texas A&M Health Science Center School of Public Health. Dr. Ory manages many community-engagement partnerships and initiatives, which consider the importance of the environment. Dr. Ory is a fellow of several societies including the Academy of Behavioral Medicine Research, American Academy of Health Behavior, Gerontological Society of America, and Society for Behavioral Medicine. In recognition of her contributions to the field, she was recently awarded the American Public Health Association Life Time Achievement Award by the Aging and Public Health Section.